Jason Martinez is a flamenco dancer and cajón player. He was introduced to the artform at the University of New Mexico, with instructors Eva Encinias-Sandoval and Pablo Rodarte. He has traveled to Sevilla, Spain and studied extensively at the National Institute of Flamenco under Joaquin Encinias and Omayra Amaya and with celebrated artists at Festival Flamenco Internacional. 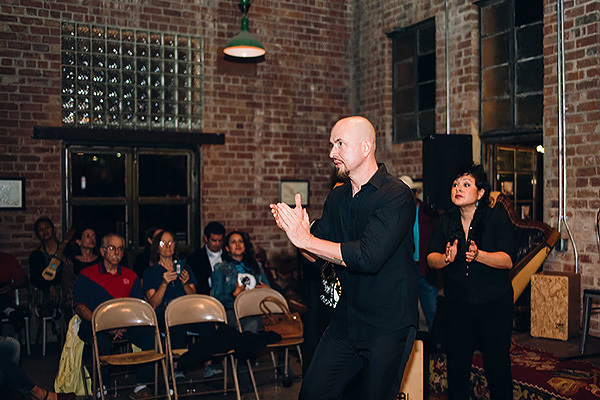 He was an original member of Yjastros, the American Flamenco Repertory Company in Albuquerque under the direction of Joaquin Encinias, and performed with the company in nine concert seasons. 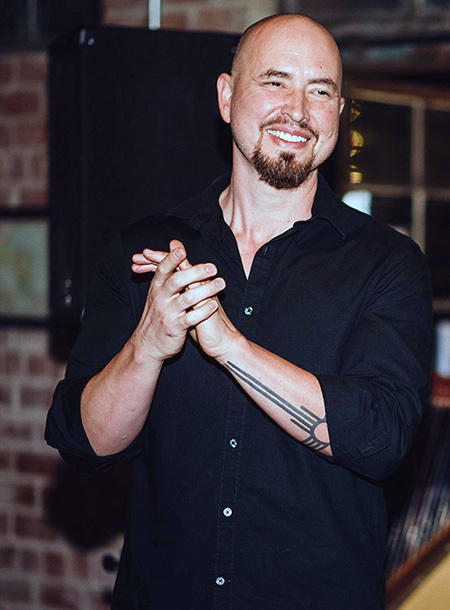 He has toured nationally as a soloist and now teaches and performs in Tucson. Jason is the recipient of a 2018 SFA Master-Apprentice Award, given annually to master artists working to pass on traditional artforms to apprentices. He will work with his wife Mele Martinez, a flamenco dancer, to deepen her practice of improvisation within the artform. How did you come to be a flamenco artist? I grew up in Albuquerque, New Mexico. My mom had been to a show in Santa Fe put on by Maria Benitez, who used to have a show there regularly and also toured with José Greco (the Italian-born flamenco dancer who popularized flamenco in America in the 1950s and 1960s). My mom was impressed by the show and told me I needed to see flamenco because she thought I would like it. I wasn’t convinced by her description. As an undergrad at UNM, I had electives to fill and they teach flamenco there at an introductory level. So I thought, I’ll try it. Why not? In elementary school, break dancing was popular, I knew as much as the next guy. I was not a trained dancer, but I figured I could handle it. Jason Martinez. Photo by Nieves Montaño. At first it was very challenging. It’s a very different way of moving. It’s a postured dance, but you still have to move with fluidity. How do you do one and the other? It didn’t make sense. My ego was the thing that kept me doing it at first. I considered myself an athlete. It was annoying me that I couldn’t do it that well. I was only one of two guys in the class and there were a lot of pretty young ladies, so that also motivated me to be there. Each subsequent class was more challenging. But the reward was incremental. Over time, I started going to shows to familiarize myself with flamenco in performance. My teachers really encouraged that. I appreciated the form for its beauty, but also for the emotional jump I’d get from it. What do you mean by an “emotional jump”? In flamenco, there’s a visceral relationship between performer and observer. Everybody is feeding off that energy. It’s not like being in museum observing a finished work of art and being quietly affected. You get to express in the moment your appreciation for what is going on. As an observer, you can almost feel the experience through the eyes of the performer. It’s a relational thing. You could be the performer as well as the observer. I said to myself, I would like to do that. To have that kind of interaction. I’ve heard other dancers in other forms say they wish for that kind of immediate gratification. Sure, there’s some ego in that as well, but it’s about a desire to connect. That’s the reason flamenco performances are more memorable in a smaller space, there’s more intimacy. Also, I’m pretty introverted person, so once I started performing, it gave me a chance to balance out my introversion with connecting to people. It lets me be that part of myself at least for a moment. What is the origin of flamenco and what are some of its main elements? Most of us understand that the artform comes the Romani people from India, who traveled across the continent to settle in Spain. Flamenco is a mixture of Romani traditions and culture and Spanish regional culture, and because Spain was conquered and re-conquered so many times, there are also Moorish and Roman influences. But primarily it’s understood as being rooted in gypsy or Romani culture. If flamenco were a religion, the cante or song would be the bible or the holy scripture. The cante is the first form of the expression and it carries so much about what flamenco is about in the way that it’s sung and in the letra, or lyrics. At its essence, cante sets the tone for everything else. The guitarist works as support to enhance the cante. But guitarists have double duty because they have to support rhythmically what the dancer is doing. The guitarist is kind of like the interpreter or the glue. Chances are the dance is the main draw in a show, so it flips the hierarchy a bit, since everyone wants to see the dancer. So the guitarist and the singer generally follow the dancer, which doesn’t mean they can’t make choices and direct the dancer. Mele Martinez and Jason. Photo by Nieves Montaño. And with all of these forms, you can never really master them truly. You can be a master of your own personal interpretation, but there’s always more you can do and learn. That makes you a more complete artist and person, the pursuit of that. It also makes you a better teacher. If you can instill that in your students, you perpetuate that internal aspect of flamenco. The foundational theme for all of it is to stand up and say, I am. And that’s on behalf of the culture, not just the individual. Identity is an underlying theme in those expressions. There are go-to songs and rhythms that you perform. Soleá is about loneliness, despair. Alegrías are, well, the word means happiness, but it’s more about fighting against sadness in a way that you enjoy. See, there’s always a dark element because the gypsy people experienced so much hardship and brokenness. Even when it’s happy, it’s happy-sad. You know, like The Cure. Flamenco is rooted in improvisation. Can you talk about that? Traditionally flamenco is only improvised. And it wasn’t really meant to be performed publicly. You did it at family gatherings. You just did it because you felt moved to do it. Everyone was encouraging each other and watching each other. As a dancer, even though it seems about me and my posturing, it is really the individual reflecting the community values. You get to be the conduit. Within the family, it’s more easily understood that you can express something that we all feel and that we all share. A performance without improvisation is kind of like a one-way conversation, even though it seems like it’s not. Without improvisation, you’ve just set the conversation and everyone is reading their script. When doing improvisation, you are not the only one helping to determine where the piece goes. Everyone is. You could look at it like a fun little game. I’m going to throw this in here and see if you can adjust. We’re all going to create this thing together, and we don’t know how it will come out, but we all know how to play and we all have confidence in each other and in the work. You get to collaborate in a really satisfying way. It’s like jazz. There’s a structure and everyone knows how to play their part within that. It’s also a language. You help each other develop your language skills as you go. Sometimes it’s fun to go on stage with someone you’ve never met before and you can make something nice, but it’s also great to work with people you work with a lot because of a shared memory. 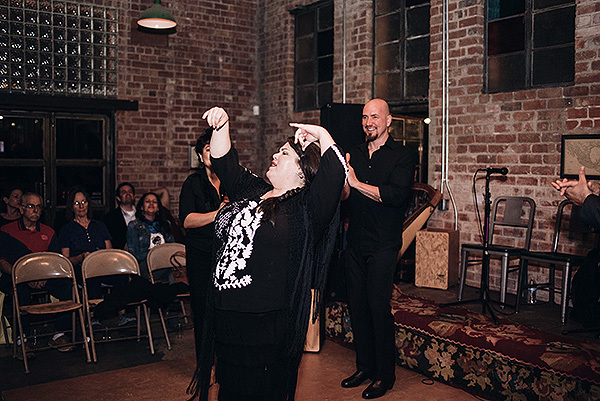 As one of the recipients of the SFA 2018 Master-Apprentice Artist Award, you’ll be working with your wife, Mele Martinez, also a flamenco dancer, to share your skill in improvisation. Mele is the more talented one. I’m the more studied. When it comes to performance, she likes to prepare and have her dance set up, rehearsed. She likes to craft it. But she hasn’t put as much effort into how to just wing it. There’s value in both. I really don’t like to set things that much. I enjoy the spontaneity. The best performances are spontaneous, and so are the worst ones. You just never know. Mele over the years has been willing to risk more. To improvise well, you have to not get too concerned with the outcome and just love doing what you’re doing in the moment. Some of the best flamenco dancers have just three steps and they know when to use them. I’m always perusing new steps, new rhythmic ideas. It’s about adding more tools to your belt. So it was a good pairing to do the apprenticeship this way, to help Mele gain more confidence. Why do you think an artform as old as flamenco speaks to our current time? Everything that’s going on in flamenco reflects what’s going on in the world. 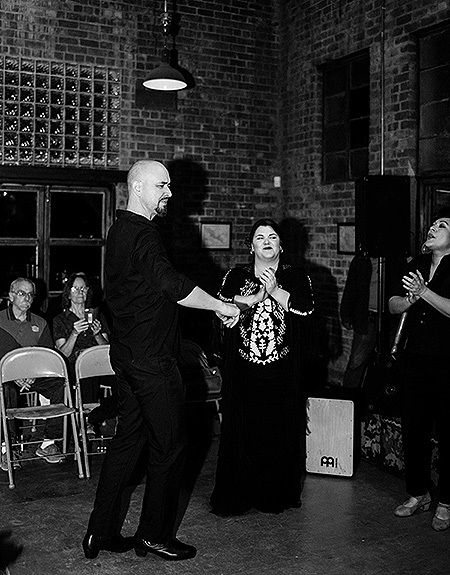 There are marginalized people, as there have always been, and flamenco is a music form from a marginalized group, so that’s an easy connection. But more so, I think it’s about flamenco’s timelessness. People enjoy it on a visceral level. It is culturally specific, but it seems to appeal to diverse people. There’s something maybe at our DNA level that desires what flamenco delivers. Wonderful story! I was at UNM at the same time, in the studio next door to Flamenco. Saw them perform several times. Took West & South African Dance and Pueblo Social Dances [teacher was Andy Garcia of the Tewa Dancers of the North; San Juan Pueblo]. UNM was a positive hotbed for folkloric dance forms: also concurrent was Mexican Folklorico. As an American Studies grad student, I got to take dance in lieu of language.